Hope no one got blown off their bike in all the windy days we have had! Our easy social rides got started with Norman leading our ride in March. Since Easter will be on the third Sunday of the month, our next ride will be on 14 April leaving from near the children’s playground in Woking Park at 2 P.M. Please bring a spare inner tube for your bike since it is easier to change tubes rather than repair one. The saga of Muddy Lane has finally come to a close. Or I should say, the public inquiry has come to a close. The site visit was on Weds. 20 March followed by final summations that afternoon. We now await the adjudicator’s decision. We are not 100% sure we will win but at least we tried. I will let you know the final outcome. Easter Sunday, 21 April, will be George James’ Elmbridge cycle club’s “ Somewhat interesting Easter Egg Hunt.” George will explain the full details on the day, but briefly you’ll be riding in twos or threes and will need to navigate to various interesting places around the area where there will be some kind of “easter egg” to find. There is no fixed route, but expect to cycle around 15 to 20 miles or so depending on how many short-cuts you know or can find. The start will be at the usual place, outside the Hand and Spear pub near Weybridge Station at 11am.The final destination will be announced then where the prizes will be given out and usually we stay on for a late lunch. Pub night is this coming Tuesday 26 March at the Sovereigns pub on Guildford Road. Don’t forget to register your number plate at the bar if you come by car to avoid a hefty charge. Personally I always want to remind them that the only reason we have such a good surface on the towpath is because money from Cycle England was given to Sustrans to improve the surface of the towpath and to suggest we use the roads instead is especially annoying. BUT we have to live with our neighbours so adopting the “Share the space, drop the pace” and “two tings” is a good thing. I wish the pedestrians would also remember not to walk across the whole path so no one can pass but if we are all considerate of others, this will also happen. Public awareness campaigns to encourage cooperative shared use of towpaths seems the best way forward. So please pass this on to other cyclists you know and encourage them to Share the Space, cut the Pace. Norman is working away on setting up regular meetings regarding cycling with WBC and SCC. Remember to Light the Night to be seen when you are cycling. Our last pub night of the year is Tuesday 27 November at the Sovereigns on Guildford Road. Now that our rides are finished for the year there are a few campaign issues I would like to bring to your attention. As cyclists I think this proposed one way system is of interest to us and our community. If this one way system goes ahead and a provision is not made for cyclists it could force us on to the busy A322 on a very busy stretch, through dangerous bends where there is currently no cycle path. I know quite a few of us use Ford Road/ Lucas Green Road when cycling over towards West End, Bisley, Lightwater, Bagshot, even if only occasionally. The Surrey County Council Consultation runs until the end of November. If we could share this amongst our cycling community that would be great. So long as safe provision is made for cyclists I personally would not be opposed to a one way system. My concern is cyclists safety being over looked. “I would like to arrange a regular meeting with Geoff McMannus at WBC I rather like the opportunity to meet 3 or 6 monthly… please see what folks think. Who would like to join me at the meetings? Also I would like to contact the WBC officer who has the job of encouraging shoppers into the town centre. We could encourage cycle use- ” saving car miles, parking fees and time” if we had WBC detail the easy cycle routes in, especially from the Pyrford, Sheerwater, Woodham points. Thoughts please. A few years ago we had a forum meeting about 3 times a year where we discussed cycling issues with members of SCC. They came to an end when the role of dedicated cycle officer was cut. Norman recently has been meeting with the WBC to champion our case for consideration of cyclists in and around the town centre. He would welcome some company at these meetings. If you would like to help and join Norman, please reply to this e-mail and I will pass on your information to Norman. We heard from Daniel Williams about his response to the objections that caused the enquiry on Muddy Lane to be adjourned in May. We have read it and think it is very positive for us. But we have thought that before so we shall see. Our last pub night of the year will be 27 November. We don’t have a pub night in December. A reminder to be sure to have lights and reflectors on your bikes so you can be seen in the dark. 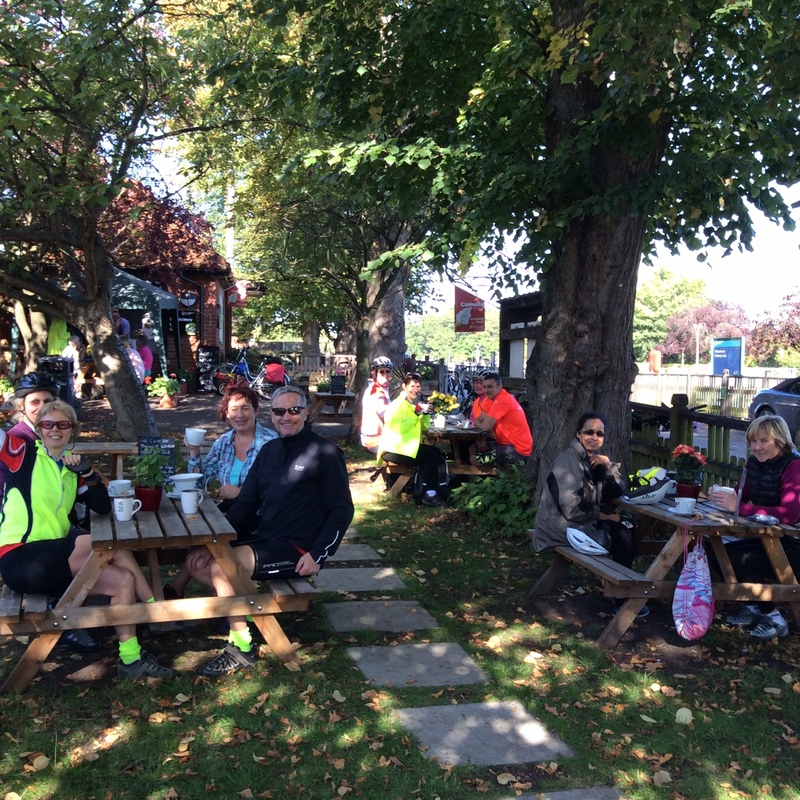 Our last Easy Social Sunday ride will be Sunday 21 October. We will be checking out the Acers in Windsor Great Park. The leader of the ride will be Sandra Lee. She will be leaving the usual place near the children’s playground in Woking Park at 2PM. The acers should be lovely this year. Our pub night will be 30 October at the Sovereigns on Guildford Road. Steve or Norman may be there to once again show what is being planned for cyclists in Woking in the future. A reminder that our long afternoon ride will be this Sunday, 7 October. We will be leaving from our usual place, near the entrance to the children’s playground in Woking Park at 2:00. The ride will be following the tow path to Weybridge where we will pick up the new off road bicycle route to Walton bridge, where we will have tea. The ride will be a little longer than usual, around 20 miles, and we will be back a little later than usual. Karen will be leading the ride and if you need to contact her, the number is 07745208838. Norman and I went to the exhibition regarding the planned redevelopment of Guildford Rd. south of Victoria Arch. They are proposing to remove the gyratory and make it two ways. A public consultation is on line until 24 October and we urge you to look at the proposal and let them know your views. Personally I object to the fact that you cannot turn left into Heathside Rd. therefore making it very difficult to get to Woking Community Hospital by car. Follow the link to the consultation, https://www.woking.gov.uk/guildfordrdconsultation and give your opinion. Norman and Steve had a meeting with SCC and WBC engineers about plans for town cycling in the future. There are many plans afoot. Steve brought the plans of the proposals to the last pub night to show us. He said the people they talked to actually were very interested in putting in quality cycling facilities and so constructive criticisms would be welcomed. I will see if Norman and/or Steve are able to come to the next pub night, 30 Oct., and bring the plans if anyone wants to come and see them. Our easy social ride will be this Sunday 16 Sept. starting at 2PM from near the children’s playground in Woking Park. We will be going across Whitmore common and having tea at Rokers before heading back to the Park via the Hoe Valley path. If you need to contact me, my mobile number is 07746 394639. Our long afternoon ride will be on 7 October led by Karen Smith. She will be leaving the usual place at 2PM but will be back a bit later than usual. The route will be along the towpaths to Weybridge and then along the new cycle route from Weybridge to Walton Bridge. Tea will be at the bridge and then back along the Thames path. It will be about 20 miles long and promises to be a really flat route! If you need to contact Karen, her mobile number is 07745 208838. Norman is meeting with someone from Woking borough council next week to try and sort out some cycling problems which we are all having with all the construction going on in the town centre. He hopes it will be productive. One good bit of news has been the initiative to widen the existing footpath to create a shared footpath and cycle path along the A30 between Camberley and Bagshot. To read all about it, click on the link under ‘Latest news’ on the Welcome page of the website. Pub night will be Tuesday, 25 September at the Sovereigns on Guildford Road. Our Treasure Hunt which was set by Ralph Brown was a fun ride. Karen and Andrew Smith were the winners. Thanks go to Ralph for all his hard work. He might even be persuaded to do another one next year! I will give you a little extra warning to remind you that our long afternoon ride will be on 7 October. We leave from the leisure centre at the same time but we will be back a bit later. Barbara will be leading us to Walton Bridge via the new bike route from Weybridge. Pub night will be next Tuesday evening, 28 August at 7:30 at the Sovereigns Pub. “Yes I was expecting a date before the end of this year at the latest. I think the Planning Inspectorate are under a lot of strain at the moment- every transaction seems to be taking 2-3 times longer than it did a few years ago. I suspect like many public bodies they have been cut to the bone. It gives plenty of time to prepare and time to forget where we were if we are not careful.” So the saga continues. Save the day. We are having a treasure hunt as our ride in August. That is 19 August, 2018. We will be starting from our usual place…near the entrance to the children’s playground in Woking Park at 2PM. Riders will follow clues and see how many answers they can find in two hours. Then it is a return to the Leisure centre to find a winner. We hope it will be a fun afternoon and suitable for all the family. Other news and dates for your diary. 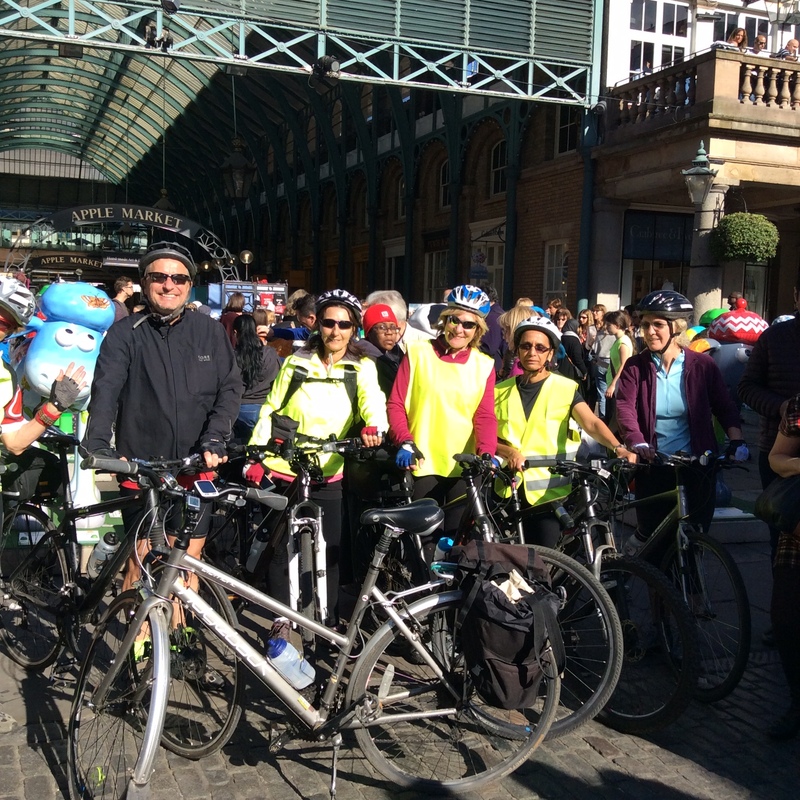 The Prudential Ride London Free cycle will be Saturday 28 July. Follow the link to the Web site to sign up. https://www.prudentialridelondon.co.uk/events/freecycle/. This is a fun day for the whole family riding on traffic free streets around central London. Either go up to London by train or if you would like to add a little extra cycling, join the group who leave from Kingston on a led ride. You can find the information about where they are meeting when you register to participate and follow the link under the “led Rides”. The rides are very well organized and only 14 miles to where they leave you in London. When I have gone on these rides we have taken the train to Surbiton and then cycled to the meeting place in Kingston, usually by the market, and ended up on the Mall by Buckingham Palace. Other events on the day are: Ride London Classique Pro women’s race starting at 17:00, the Brompton World championship final at 19:15 and the 2018 Prudential RideLondon Handcycle Grand Prix which will start at 19:50 . The Brompton race is always interesting because no lycra is permitted and fancy dress is encouraged. The race starts on the Mall with a Le Mans-style dash, with entrants frantically unfolding their Bromptons before taking on the 16km circuit. There are all sorts of things going on that day in the Festival Zones between 9 and 4.Here is a link to the map or the route and where the festival zones are. https://d1ffaecguugkl4.cloudfront.net/ridelondon/live/uploads/cms_page_media/73/FreeCycle%20Map_2018.pdf. Norman has been busy campaigning on our behalf when not cycling around Bulgaria with Steve. He noticed a prohibition notice for cyclist at the High Street end of Chapel Street. Since Commercial Way from Goldsworth Road up to the High Street end of Chapel Street are designated National Cycle routes he asked for this to be removed. This has been done. Things are definitely a challenge for cyclists in Woking at the moment but when this all is finished he is hoping we will have better routes . He and Steve have set up a meeting to discuss cycle plans in September with a member of the council. We are still waiting for a new date for the resumption of the Muddy Lane Inquiry. Hope to see many of you on our treasure hunt. Happy cycling and don’t forget to keep hydrated on rides in this weather. I forgot to send a reminder that Pub night was last night but I did want to remind those who are interested in a nice long all day ride, that ours will be this Sunday 1 July. It will be to Shoreham via the Downs Link around 40 miles and led by Barbara Rossouw with back up from Chris Jeggo and Karen Smith. They will be leaving Woking Park meeting where we usually meet by the children’s playground at 8:15. If the weather stays hot, be sure to take lots of water and a swim suit if you want to take a dip before catching the train home. If you intend to go will you please give Barbara a call on her mobile 07742809031 or email her on Barbieross2@gmail.com, so she won’t leave without you. And don’t forget to take a spare inner tube, or two. Our AGM was held on 18 June and the minutes can be read on our website under the Useful Information heading. Cycle to work day is back. This year it will be Weds. 15 August. www.cycletoworkday.org copy the link, pledge miles and maybe win a prize! We have also had an appeal to “Ride to the Moon-save a Dad ” to tackle prostate cancer. Read all about it and get involved! : http://cycletothemoon.tackleprostate.org/ I have attached the poster should you want to organize an event at work or pass on the message to other cyclists. You can even contribute miles by spinning in the gym. Meanwhile we are still waiting to see the date when the Muddy Lane public enquiry will resume..
Another note for your diary. Les Bowerman informs me that the Veteran-Cycle Club Ripley Section’s Jumble sale will be 15 September in the Ripley Village Hall. Our next easy social ride will be 15 July starting near the children’s playground in Woking Park leaving at 2PM. Norman will be leading the ride so should you need to contact him on the day, his mobile number is: 07761221310. Don’t forget to bring a spare inner tube for your bike. Pub night will be 31 July. Take care when cycling in this heat and drink a sufficient amount of water. Summer is here, the sky is blue. May it continue! This is Bike Week and I hope you pledged miles and are just waiting to see if you won a bike. Our Bike Week ride will be this Sunday, 17 June starting as usual from near the children’s playground and Woking Park, leaving at 2PM. Since it is part of Bike Week, it is free. It will be led by Julia and Val and will mostly be on the canal tow paths so road bikes really won’t be suitable. Tea will be at the Anchor. Julia’s mobile number is 07989552436 should you need to contact her on the day.. The Muddy Lane Inquiry was adjourned due to a late submission by the main objector. A new date was made which was to be 26 June, but unfortunately that date has also had to be cancelled since Daniel Williams , our chief witness, has a conflict of dates. So no Inquiry on 26 June. I will send an email when the new date has been decided. Our AGM will be Monday 18 June 2018 at 7:30 at Old Woking Community Centre, Sundridge Road, Old Woking. This is right next to Woking College off Rydens Way. Come and hear a report on our various campaigns including Muddy Lane. Come and tell us what is on your mind. If anyone would like to join the committee, that could be arranged. I suggest you let Barbara know if you will be going on the ride so no one will be left behind—at the start! Her email is Barbieross2@gmail.com, and if you need to contact her on the day, her mobile is 07742809031. Pub night will be 26 June at the Sovereigns. Only one more week to go to see if we actually mange to get Muddy Lane opened to cyclists. The public inquiry will be held at Woking council chambers on May 22-23 starting at 10:00. Everyone is welcome to attend and support our request to have the Map modification order confirmed. You don’t have to be there the whole time. We did have an email from a cyclist to say they had used the lane starting from Byfleet recently without being challenged and that the gate at Mr. Garlands end was actually down. We live in hope. Soon it will be Bike Week ( 9-17 June) which encourages everyone to experience the thrills of ‘everyday’ cycling – whether that’s cycling to work, school, to the shops or just for leisure – to show how cycling can easily be part of everyday life. There are events planned all over the country. Our ride on Sunday 17 June will be shown on the event calendar. To see other events you can go to their website. www.bikeweek.org.uk And then you might like to win a bike!!! Win a Bike a day with Love to Ride! Love to Ride are giving away a bike a day, everyday, during Bike Week. All you need to do to enter the prize draw is register at lovetoride.net, ride a bike anywhere, anytime for just 10 minutes during Bike Week (9-17 June) and log your ride! We had a message from Paul Smith who is a freelance writer who helped create a guide called ‘How to Prevent your Bike from being Stolen’. It offers very useful tips and advice on keeping one’s bicycle safe from theft both at home and in parks and other public spaces. We have added a link to this excellent guide on our website. Our year runs from end of May to end of May (don’t ask me why) so this is my usual “Dues are due” email. Still £5/year or £20/5 years. Membership is for the whole family and offers free Sunday social rides and discount on an affiliated membership to CTC. To activate the CTC membership we will need to send you the code. Details of how to make payment is on the website. Our AGM will be Monday 18 June 2018 at 7:30 at Old Woking Community Centre, Sundridge Road, Old Woking. This is right next to Woking College off Rydens Way. Come and tell us what is on your mind, if anyone would like to join the committee, you would be more than welcomed. We will have a report about the Muddy Lane inquiry. Our next ride will be this Sunday 20 May led by Karen Smith. Should you need to contact her on the day, the telephone number is 07745208838. We meet near the children’s playground In Woking Park for departure at 2 PM. Lastly, our next Pub night will be 29 May at the Sovereigns Pub on Guildford road at 7:30. A lot of consultation has been going on in regard to the M25 Junction 10/A3 and two members went to a workshop regarding this. I copy their reports here Workshop-reports since I think they will be of interest to all. In regard to our usual matters, we had to cancel our first ride of the season (first time that I can remember) due to snow! So our first ride of the year now will be 15 April leaving from near the children’s playground in Woking Park at 2PM. The contact number should you need to contact the ride leader will be Norman Johns 07761 221310. May the sun shine and may it be a nice day. I sent out an email (see below – Editor) a few days ago reporting on the successful campaign to get an off road route along the A245 from Cobham to Byfleet. Also a reminder that the public enquiry regarding Muddy Lane will be 22 May 2018 at the Council Chamber, Woking Borough Council, Civic Offices, Gloucester Square, Woking, Surrey, GU21 6YL starting at 10 a.m.
Lastly, pub night will be 24 April at the Sovereigns pub starting at 7:30. Good news from Norman regarding the off road route along the A245 from Cobham to Byfleet. I have enclosed an article Norman has written regarding this long campaign which seems to have come to fruition, and a picture. I am delighted to see the work is being carried out along the A245 to provide drop curbs at the points where drives lead off this very narrow and busy road. This follows a petition presented to the Elmbridge Local Transport Committee in 2017. The Surrey County Council Engineer agreed that the road is too dangerous for other than very experienced cyclist to use. Additionally the many HGVs using this road are not able to pass a cyclist due to the narrow carriageway. 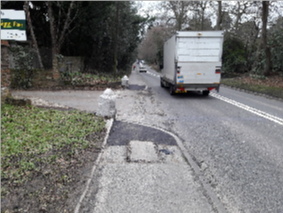 When the whole 2 miles have had the full footway cleared of encroaching material, there will be a safe 2 mile route from the Seven Hills junction to the Byfleet roundabout. Surrey Police confirm that cyclists are out of the traffic dangers when on this off-road route. Our thanks go to all the vehicle driver and cyclist supporters of the petition, the Elmbridge Local Transport committee members and the Surrey Advertiser. Norman Johns, Chair of the Woking Cycle Users Group, said that this will encourage new and young cyclists to consider cycling between Cobham and Byfleet. If only more Local Transport committee groups were willing to back petitions for off-road cycle routes between villages, the use of cars would be reduced and much healthy exercise encouraged. Some of us went to the public consultation regarding the A3/junction10 last weekend and Keith Cresswell wrote the following report which I think will be of interest to all. “Whatever the merits or otherwise of the j10 scheme, it is commendable that there is a continuous non-motorised users path from Ockham junction to Painshill, which might please our friends from GBUG somewhat (although a dedicated cycle path as would have been the case in Germany, Holland and Denmark would be preferable). However, the planners have given no thought to cyclists safety at the Ockham junction (particularly for users from Ockham Road North or Portsmouth Road to the new Wisley Lane) and as currently drafted will result in a cycle death at some stage from cyclists going across the end of the off ramp from the A3. This could be addressed by extending the non-motorised users path slightly to join with Ockham Road North and then continuing to the Portsmouth Road allowing cyclists to go the “wrong” way round the roundabout for 15 and 30 degrees respectively rather than 345 and 330 degrees as proposed as well as crossing on and off ramps to A3. (https://highwaysengland.citizenspace.com/he/m25-junction-10-a3-wisley-interchange-2018/consultation/intro/ ) or to info@highwaysengland.co.uk by 26 March. I also talked to someone who said they might have to move the non-motorized route from one side (airfield side) to the other (Wisley side) of the A3 because there was objection to taking land from Bolder Mere Lake. I suggested they keep the route on the airfield side and put a pontoon over the water with the route going over it. Any better suggestion, please let them know. Anyway, please be sure and respond and urge them to try to make the Ockham junction safer for cyclists. I would also like to remind you that Highway England has a consultation regarding the M25 Junction 10 – A3 Wisley Interchange. This is an important consultation for us because we wanted to make sure they provided safe cycle access to Wisley Lane from Ripley. The plan seems to be to make a two way road from Ockham roundabout and running along the A3 on the airfield side and then cross over the A3 on a new bridge to replace the present footbridge. It seems to me this will be dangerous to cyclists because cyclists will have to cross the roundabout and contend with cars getting on and off the A3. See what you think and let Highway England know. They have an online survey or you can go to a public consultation. Dates and places can be viewed by following this link: go to the scheme page. Our pub nights have started again so come along to the Sovereigns Pub on Guildford Road, Woking GU22 7QQ starting at 7:30 on Tuesday 27 Feb. to talk about bikey things. Before Sgt Dix arrived the Surrey Police Crime Commissioner made a short appearance. He mentioned the joint initiative between Sussex & Surrey POLICE to roll out the CTC designed Cyclist mat project details ,This has been adopted and is being used to demonstrate to vehicle drivers the need to give cyclist a clear 1.5 m space when the vehicle is over –taking cyclist[s] . After offering good cheer to the assembled group the PCC left for an engagement out county. Sgt Dix arrived ,having been held up by the heavy traffic in Guildford. After an introduction he spoke and later took questions on – The high number of cyclist deaths and injuries in Surrey. The CTC Map project. Use of video cameras by cyclists ,and the need to get recorded details of apparent dangerous driving to the the Police in 24 hours of the incident and collecting of witnesses to incidents. There are on line forms available from “ Surreypolice.com “ this is also the place to report incidents of antisocial driving. The police are staging enforcement incidents with an officer dressed in civilian clothing, cycling in locations where incidents of vehicle drivers / cyclist accidents and near misses have been reported.. The officer on the cycle will be provided with a helmet video cameras and a microphone for direct communications to a backup police team. Offenders are usually invited to a training session including the use of the “cycle mat”. Any offenders who have committed serious traffic infringements will however be served with a notice on the spot. Apparently the police make extensive use of a twitter account to spread details of offences to over 1,000 followers. There are the usual officer shortage restraints on the forces ,plenty of enthusiasm but only about 20 on road operations under taken to date. I asked Sgt Dix if the police could assist with the challenge of getting the Councillor members of local authority Transport committees interested in supporting Petitions to provide off road cycle /pedestrian routes where the road situations are too dangerous for other than” experienced cyclist”. Not having the department details to hand, Sgt Dix was given my contact details and promises to forward the details . A large number of routine questions were asked by the audience, a majority will be normal practice for WCUG members. Helmet use and visibility issues being 2 important issues. Seems a bit late to be wishing everyone a Happy New Year but this is our first communication of the year. So Happy New Year! I hope you are all ready for a fun cycling year. Norman has been busy on our behalf trying to get a safe route for walking and cycling between Chobham and Woking. He went to two public meetings to put the case forward. One was to the Surrey Heath local committee which I fear wasn’t too successful although since the meeting he has made some progress with interested parties. He then attended the Woking Local meeting and they voted almost unanimously (only one dissent) to support the idea BUT it was the usual addendum….. “When Transport funding is available”. He has also had a site meeting in regard to the cycling problems in Woking town centre/Victoria Arch area during the town rebuilding. Here is what was decided: “ The bollards separating the High St bus stop area [near to Victoria Arch] from the walkway will be moved onto the road in order to reintroduce the wider pedestrian route This will cover the newly painted cycle route markings which cannot be extended down to the junction yet. An additional large road sign has been located on the Police Station side of the Victoria Arch so as to tell the drivers that they are entering a zone where they cannot pass cyclists (like the sign as one enters the narrow road section leading from the town side of the Victoria Arch). On the opposite side of that road section, the cycle way signage and lines are all but obliterated and covered in surface mud. This, and further bollards on this side, will be given attention. Here I am not sure if SCC will act or WBC act on their behalf. Regarding Muddy Lane, we have received confirmation that the public inquiry regarding Surrey County Council requesting a map modification order to change Muddy Lane to a bridleway will be held on 22 May 2018 at the Council Chamber, Woking Borough Council, Civic Offices, Gloucester Square, Woking, Surrey, GU21 6YL starting at 10 a.m. If you would like to attend and especially if you wish to give evidence, you should let me know so I can tell Daniel Williams, who is the SCC officer in charge. Highways England have decided on the preferred option in regard to the M25 junction 10/A3 improvement scheme. To read the proposal please follow this link http://roads.highways.gov.uk/projects/m25-junction-10-to-a3-wisley-interchange/ then the consultation link and finally the preferred route announcement leaflet. They will be having the public consultation sometime in early 2018. We need more people to lead our rides this year so if anyone can see their way to helping out with this, would they please let me know. We are going to have a roster and can provide routes for those who are interested. The rides are held monthly from March to October on the third Sunday of the month, leaving Woking Park at 2 pm. Pub night starts again next Tuesday 30 Jan. at the Sovereigns pub on Guildford Road from 7:30. We had a very nice Christmas dinner and the Sovereigns did a fine job of serving us. Thank you to Sandra for getting it all organized. It is a pity our Pub night happens to be on the same night as the invitation from G-Bug to attend their open meeting. It starts at 6pm at Guildford Council Offices, Millmead. Sgt Phil Dix of Surrey Police Road Policing Unit will present on how the unit is endeavouring to protect cyclists and other vulnerable road users. Here is hoping the weather improves soon. I see Cycling UK has us down as a campaigning group. This email will seem to agree with that! First. I would like to thank everyone who signed our petition regarding a safe cycle and pedestrian friendly route from Chobham to Woking. This petition has met the relevant criteria to be considered by the Local Committee (Surrey Heath). The meeting on 30 November will be held at St Michael’s Church, 286 London Road (A30), Camberley, GU15 3JP and will begin with informal question time 6-6.30pm. The meeting officially starts at 6.30pm. The meeting should be finished by 8.30pm and there is no obligation to stay for the full meeting. The Committee will consider the petition at the meeting. Since we had over 100 signatures, Norman will be able to speak. You are more than welcome to attend and listen to the debate if you would like . The second meeting will be at Woking Council Offices on 6 December, same time frame. Second. We have heard regarding The Surrey County Council Upgrading of Footpaths No. 129 Byfleet, 3 Wisley (Part) and 566 Wisley to Bridleway Status Definitive Map Modification Order (That is Muddy Lane to most of us) . The motion was passed in the local committee but since there were objections, it had to be sent to the Secretary of State for confirmation, now the Order is to be determined by an Inspector appointed by the Secretary of State. This leads us to a public inquiry. We have been offered 22 May for 2 days for the inquiry. Once the date has been made definite Daniel Williams and Catherine Valiant, Surrey County Council Countryside Access Officers will decide who they will be calling as witnesses. Daniel says he is hoping that he can get a good cohort of witnesses along. His normal practice is to call users as witnesses where possible. Once we have the date, if you would like to be a witness perhaps you can email me so George and I can pass your name on to Daniel. This is in regard to your view on the implementation of a 20MPH speed limit. Next. Norman had a fruitful discussion with those who came to the last pub night regarding Tube maps. They have a plan! He was happy for the input from Nigel Burke from the G-bug group. Last. Norman received an email as part of the consultation on the proposals to improve walking, cycling and horse riding infrastructure around the A3 / M25. The proposals seem to relate to plans to create a sustainable new community at Wisley Airfield and did not seem to be the same as the one the Highway commission had last December. Having looked at it, our main concern was that there was still no way to cycle from Ripley to Wisley Lane safely. I hope that is all the campaigning issues for the moment. Our social rides are finished for the year and won’t start again till next March but we have one more pub night for this year. It will be next Tues 28 November at the Sovereigns . We will not have pub night in December so the next one will be at the end of January. Christmas dinner is 7 December for those who have signed up starting at 7 PM at The Sovereigns, Guildford Road, Woking. I will let you know what transpires in regard to the Norman’s safe route from Chobham To Woking. Happy cycling and please be sure to light up your bike at this time of year so you can be seen. With the low sun it is even a good idea to keep your lights on during the day. Just a quickie to remind everyone that our last Social ride of the year will be this Sunday 15 October, to check out how the Acer wood at Windsor Great Park is looking. Hopefully in full colour. Sandra will be leading and leaving at 2 from our usual meeting place, near the children’s playground in Woking Park. After this one, our next ride won’t be till the third week in March of next year. Those who would like to carry on riding in the winter have many choices. For the ladies only there is the Breeze rides on Thus. mornings about twice a month. For everyone who would like to do 15 mile rides, the Woking CC Saturday Social rides are most Saturdays at 9:30 leaving from the green outside the Cricketers in Horsell. You can get information regarding their rides by searching for them on Facebook. Their club for more experienced riders is under Woking CC. 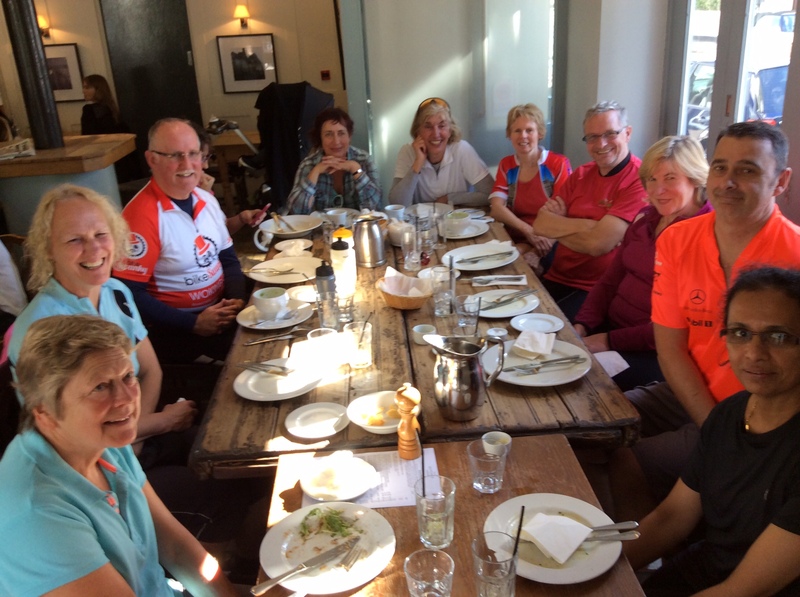 The Elmbridge cycle group continue with rides of 25-30 miles on the second Sunday of the month. More information about these and other rides an be found on our website. Also it is not too late to sign the petition started by Norman to provide a safe route from Chobham to Woking. Here is the link http://petitions.surreycc.gov.uk/SafeRouteChobham/ You have until 9 November. Lastly, pub night this month is 31 October at 7:30 at the Sovereigns, Woking. What happened to that wonderful Indian summer???? Never mind, there is still time for it to return. I hope you have all seen that someone obviously listened to Annette’s complaint regarding parking on the shared pavement along Victoria Way opposite the hotel. A few leaflets cleared a lot of the cars/vans and now they will be installing some bollards to prevent them from returning. There is still time to sign our petition for a family friendly route from Chobham to Woking. We have over 100 signatures at the moment which means at least Norman can address the council when the meeting is held. “because I’m currently involved with a brand new cycling initiative, www.free2cycle.com, and it appears that we have a common interest in encouraging more participation in cycling. Whilst current cycle to work schemes attract about 2% of the workforce, www.free2cycle.com is targeting the other 98%. www.free2cycle.com track their cyclists progress and provide their sponsors (employers, charities etc) with a monthly carbon report confirming their carbon savings. By lowering their carbon emissions, reducing parking and traffic congestion and improving the health of their workforce, sponsors (employers,charities etc) are rewarded with an extremely positive cost benefit ratio. Perhaps you or your members could qualify for a free bike? Our all day ride this year will be 1 October. This year we will be going to Denbies near Dorking for lunch via Polsdon Lacey and then back via Leatherhead and hopefully even find the Chatley Heath Semaphone Tower. We will meet at 10:00 at our usual place near the children’s playground in Woking Park. The ride will be about 35/40 miles with a few hills to add interest. If you are joining us will you please be sure to have a spare inner tube for your bike with you. I am delighted to say that Sandra has taken up the challenge and will be leading the ride this month. That is Sunday 17 Sept leaving from our usual meeting place near the children’s play ground in Woking Park at 2PM. Once again, if you are joining us will you please be sure to have a spare inner tube for your bike with you. Pub night is 26 Sept. at the Sovereigns on Guildford Road, Woking. I’d also like to congratulate Annette and Norman who actually managed to get something done regarding all those cars and vans that park across from the Double Tree Inn and block the shared cycle/pedestrian pavement. P.S. I hope you have signed our petition! If you know of any others who might sign the petition, please pass this on. Annette has been trying to get Woking to do something about all the parking on the shared pedestrian/cycle pavement in front of the flats on Victoria Way (opposite the Double Tree Inn). Many days it is almost impossible to even go down there on a bike for the sheer number of vehicles. I fear she is being passed from pillar to post but we will just have to see if anything is done about it. On to something completely different. Be aware that Cycle to Work Day is Sept 13 with lots of prizes and incentives to cycle to work, at least that day. I hope this link will take you to all the information. www.cycletoworkday.org. Our easy social ride will be on 20 August leaving from the meeting point by the children’s playground in Woking Park at 2pm. Pub night is 29 August at the Sovereigns on Guildford road. I should warn you that our easy ride in September may have to be cancelled. The gods have conspired to make it impossible for our usual leaders to lead this one. We will keep looking and let you know for sure in our next WCUG matters. Hope you are not getting too hot on your rides! Take lots of water. If you want something a little more gentle, you might like to join us on our easy social ride this Sunday 16 July starting from near the children’s playground in Woking Park leaving at 2:00. Pub night is 25 July at the Sovereign’s. Our long afternoon ride will be next Sunday July 2. We will be meeting this time at the Bridge over the Canal by Bridge Barn and will be going out to Staines via Lyne and back along the Thames path. We will be leaving at our usual time of 2 but will be going about 24 miles and will be back later than usual. George James is going to be leading a ride to Shoreham by the Sea on 9 July down the Downslink. They will be returning by train. If anyone is interest, perhaps the Woking contingency could meet the Weybridge group in Guildford at the start of the Down’s Link. Let me know if you are interested. It will be an all day ride. Bike Swanky have some organized rides which can be found on their web site. www.bikeswanky.com. They even have rides for women only on Weds. starting at 5:30p.m. as well as early morning rides for the serious cyclists. We have received a request from the Basingstoke Canal joint management Committee to ask if anyone would like to apply for a position as a non-voting co-opted Member of the Committee. The brief would be to represent the cycling interest on the Canal towpath. They would require a response by 13 July 2017, which will be considered and voted on by the Committee at its meeting on 26 July 2017. If anyone would be able to fulfil this role would they please let me know soonest so I can send you the expression of interest form to fill out. Saturday 29th July 2017 West Byfleet Live Time: 12pm- 5.30pm West Byfleet Recreation Ground, Camphill Road, West Byfleet, KT14 6EG This is to let you know that I will be at West Byfleet live on the Saturday with a crime prevention stall and bike marking. You don’t need to bring your bike all you need to do is bring the details and I can give you the markings to put on your bike. What I need is bicycle make, bicycle model, frame number (this can always be found underneath the bike by the pedals just turn it over and take the number down) and colour. Once I have got this information you will be able to register other things on immobilise free of charge on the website. This information I will give you when you register your bike. It is so important when a bike is taken to have that number written down somewhere so you can give it to the police. I’m trying to do this for bike marking because it is of course the weekend of the bike race, so bicycles seem to be in the upper of our minds at the time, and there are too many bikes out there that aren’t registered and how many of you have looked at your frame number. l bring information with me so you can actually register them yourself if you can’t do it at the time. I think that is about all for the moment. Our normal easy Sunday bike ride will be 16 July starting near the children’s play ground in Woking Park and Pub night is this Tues. 27 June. 7:30 at the Sovereigns on Guildford Road. Wonderful weather so I hope everyone has been able to get out for a little…or long… ride. If you want to do some charity rides, there is a link on our website for a few we know about, plus a link to a charity that might still have places for the Ride London. We will be holding our AGM on Monday 12 June at 7:30 at Old Woking Community Centre, Sundridge Road, Old Woking, GU229AT. This is right next to Woking College off Rydens Way. Enter by the main entrance as the hall we are booked into is on the upper floor above that entrance. Come and tell us what is on your mind. I really regret to announce that our treasurer, Richard MacCutchan, has had to relinquish his role due to so many other commitments. So HELP we need a new treasurer. All those who are interested (pray there is at least one person ), please contact me by email and I will have Richard send you an email describing his roll. He assures me it isn’t too onerous. We want to thank Richard for all his work over the years and also his help on our Sunday rides, which we hope he will still attend. Attending the rides is not a prerequisite to being the treasurer I hastily add. We could also use a recording secretary who would take the minutes of the AGM. We have received an invitation from G-Bug to attend one of their open meetings at Guildford Borough Council offices (Millmead House, Millmead, Guildford GU2 4BB) at 6pm on Tuesday June 6th. They will be having two guest speakers Clare Rogers from Enfield Cycle Campaign and Paul Gasson from Waltham Forest Cycling Campaign. Both of these groups have made some significant changes occur in their areas to make the streets safer for everyone. A link to their invitation and more about their aim can be found on the link on our Webpage. We heard from Les Bowerman that the Charlotteville CC Cycle Jumble Sale is to be held on 8th July at Ripley Village hall. Once again all information on our Webpage. Sadly for those who have been members of our group for a number of years, you may remember Hillary Griffiths. Unfortunately she lost her battle with leukaemia on 2 May and will be buried at Clandon Burial on Wed. 17 May at 12 noon. Bike week is 10-18 June. There is a web page if you want to check out rides in different locations. www.bikeweek.org.uk The Guildford G-Bug group are sponsoring their annual Around the Hog’s Back ride on Sunday 11th June, it departs at 9:30am from the Guildford Borough Council Car Park, Millmead, Guildford, GU2 4BB. It is free and suitable for all ages and abilities. A link to their ride is on our Webpage for more information and the address to let them know if you are joining them. It will be a nice way to get to know members of the G-Bug group. We will be having our monthly ride at the end of Bike Week, 18 June but before that, we will have our May monthly ride on 21 May meeting at the Leisure centre at 1:45 for departure at 2. Pub night will be 30 May at The Sovereigns on Guildford Road, starting at 7:30. I am sure I have forgotten something…. oh yes, it is May so I suppose the title of this “matters” should be “Dues are dues” Still only £5 for a year and £20 for 5 years. Our year strangely runs from 31 May to 31 May. As a member you can take out affiliated membership for Cycling UK (formerly CTC) for £24 and receive 3rd party insurance. I received the following in regard to our Muddy Lane application for a MMO (Map Modification Order). At least it is still moving along. “Following the first public consultation, it became apparent that a small part of the route is over land where ownership cannot be determined. On 14 March the Secretary of State granted Surrey County Council dispensation on this so another 42 day statutory public consultation period has now commenced ending 8 May after which the Secretary of State will make a decision.” Dare we hope we can cycle Muddy Lane starting this summer???? Norman has been working away on the pedestrian and cycle friendly route from Chobham to Woking and is about to launch a petition. When we have the details, I will send an e-mail so you can sign the petition. Norman went to the Space for Cycling workshop in London at the end of Jan. and he will be at our next pub night to fill us in on what was talked about and especially the “tube maps” that he and others are working on. Pub night this month will be on 28 March. It is at the Sovereigns on Guildford Road in Woking starting at 7:30. Our first cycle ride of the year was yesterday and the weather was pretty good and Norman was delighted there were no punctures! Please remember to bring a spare inner tube for your bike. Our next ride will be on the second Sunday of the month April 9th. I hope everyone has perfected the Dutch reach and practice it all the time. Do you know about the Dutch Reach? George James from the Elmbridge cycle group plus Cycling UK have been spreading the word that we should adopt the same here in England. Have you ever had a car door open in front of you and caused you to swerve, or actually been knocked off your bike? Usually it is just carelessness on the part of the driver not looking. The Dutch make it imperative that everyone learning to drive must use the Dutch Reach. This is a simple manoeuvre by which the people in the car must use the far hand rather than the near hand to open the car door. As you reach across your chest, your body naturally turns, making it easier not just to check your mirrors for oncoming traffic (including cyclists), but also places you in a position to actually see the traffic. If it’s safe to do so, you can then open your door, and as you’re reaching across your body, you can ensure the door only opens partially, and not to its full extent. Simple really. Try it! You will like it! And if we can get everyone to do it, it might save a life. Keith Cresswell, George James, Marion Melcher (footpath officer of the Muddy Lane area) and myself, all wrote to our MP Jonathan Lord asking him to urge the Secretary of State to move quickly on the appeal regarding the MMO to designate Muddy lane as a bridleway. We have had a favourable response so here is hoping it will be sorted before another summer passes. We had a very interesting conversation with Martin Taplin from Guildford G-Bug at the last pub night. Martin showed us a map he had devised to present to Highways England as part of the consultation on the M25 junction 10/A3. He suggested a mainly off road route from Ockham roundabout to north of the M25 and on to Cobham roundabout. Others from Guildford G-Bug are pushing for proper segregated cycle lanes along the A3. I hope you all made your views known in regard to the consultation. Of course this is only the first consultation. The next step will be an announcement of the preferred route plus a full public consultation on the preferred route. Both of these will be in late 2017. Norman attended the Space for Cycling Roadshow that was held the end of January and found that the 2 sessions he attended really worth while. He was able to network with reps from six other Surrey Boroughs during the “creating a tube map”session. He is very interested in doing this and is working on the tube map with George James, Keith Cresswell, and Nigel Burke (Guildford) . If anyone else would like to get involved please let us know. Our easy social rides will be starting next month. The first ride will be on 19 March leaving from the Woking Leisure centre at 2PM. Rides are free for all members and £1 for non-members. Rides will be about 15 miles with hopefully a stop for tea along the route. May I please ask participants to be sure and bring a spare inner tube for your bike. Pub night is next week 28 February at the Sovereigns Pub, Guildford Road at 7:30. Hope to see you there. I hope you are enjoying the cold weather! I thought I should write a few thoughts for January. Our rides for this year will be 19 March, 9 April, 21 May, 18 June, 16 July, 20 August, 17 September and 15 October. Most of them are on the 3rd Sunday of the month except for April when we will have our ride on the second Sunday of the month so we can be free to join George James’ Elmbridge Easter hunt on Easter. Steve Mallard one of our members is leading a cycle ride in Bulgaria this summer under the CTC cycling holidays banner from 24 June to 8 July. This year he will be going to the Central Balkans mountains and visiting the capital of the 2nd Bulgarian Empire and a Thracian Tomb World Heritage Site. I was in Veliko Tarnovo many years ago… by car, I have to admit…and found the architecture and scenery stunning. You can find out more about it and see if there are any places left by following the link. http://www.cyclingholidays.org/tours/solo.php?Tour=1730. There is still time to have your say regarding the consultation by Highways England in regard to the M25 junction 10/A3 improvement scheme. Our main concern is the provision on cycle lanes both along the A3 and the entrance to Wisely. There is a form you can fill out. To see the consultation documents and give your feed back, go to http://roads.highways.gov.uk/projects/m25-junction-10-to-a3-wisley-interchange/ Some of us are going to discuss the issue along with those from Guildford at the next pub night. Perhaps you would like to join us. Norman has had some success in his campaign to get a family friendly walking and cycle route from Chobham to Woking. There will be an article in the local paper which he is hoping will get some support. Pub nights start again this month, 31 January at 7:30 at the Sovereigns Pub on Guildford Road, Woking. Hope to see you there. Just a reminder that our last pub night of the year is next Tuesday 29 November at 7:30 at the Sovereigns. We do not have a Pub night in December and the next one will then be Jan. 31, 2017. For those who have signed up for it, our Christmas dinner is on 7 December at the Sovereigns at 7:00, please remember payment is in cash. Lastly, George James reports that Norman’s petition to make the pavement along the A245 between Byfleet and Cobham into a shared space, has received some good news. They are going to clear the path. Our hope is that if they find, after the path is cleared, that it is wide enough, they might at least sign it for shared use. It is getting cold out there but hopefully there won’t be too much snow this winter and we can all keep on cycling…….with a few extra layers to keep us warm. I hope everyone has been enjoying the wonderful autumn weather. We had fabulous weather for our all day ride around Hampshire villages led by Robin. Cool to start with but then the sun came out. It was amazing how quiet the lanes were in the area. We saw many cycling groups and very few cars. And those we did see were actually very respectful. Our last easy ride for the year will be this Sunday, 16 October, leaving at 2 from our usual meeting place, near the children’s playground in Woking Park. After this one, our next ride won’t be till the third week in March of next year. Those who would like to carry on riding in the winter have many choices. For the ladies only there is the Breeze rides on Thus. mornings about twice a month. For everyone who would like to do 15 mile rides, the Woking CC Saturday Social rides are most Saturdays at 9:30 leaving from the green outside the Cricketers in Horsell. You can get information regarding their rides by searching for them on Facebook. Their club for more experienced riders is under Woking CC on Facebook.The Elmbridge cycle group continue with rides of 25-30 miles on the second Sunday of the month. More information about other rides an be found on our website. I said in my last WCUG matters that Action Bikes had closed down and they were moving back to their home base in Addlestone. They are called Surrey Cycles, 75 Station Road, Addlestone and they will still honour our membership card for the 10% discount. Norman continues trying to make some progress on reinstating the cycle/pedestrian route from Chobham to Woking. No good news yet. Make your choices and e-mail them to Sandra sandra_sgs_57@hotmail.com by 23 October. Pub night will be Tues. 25 October. Still time to pledge to cycle to work this Weds., Sept. 14, and be in line to win prizes! Follow the link under ‘Latest news’ on the Welcome page of the website. Only one day left to sign up! As you might have seen in the local paper, the Woking Bikathon will no longer be put on by the Rotary. They have raised a large amount of money for different charities over the past five years but the number of entrants have been in decline. Also it looks like we are loosing two cycle shops in Woking. Action Bike is closing their Woking branch although they will still be in Addlestone. Also I am a little late in seeing that Switchback in Woking closed last April. They are now affiliated with Giant in Guildford (the bike shop in Knaphill has also closed – Editor). On to more upbeat matters. Our all day ride is coming up on 2 October. This year we will be starting from Winchfield station and doing a circular route around Hampshire. There will be a few hills but lovely quiet country roads and views. We will be stopping in Odiham for coffee, The Four Horseshoes Pub in Long Sutton for lunch and tea in Hartley Witney before catching the train back to Woking. The circular route is about 25 miles but those who would like a longer ride, can join the “break away” group led by Norman, from Crookham Village back to Woking. This is about 17 miles. If you want to join us please send me an e-mail and let me know and I will send further details. mecafrost@ntlworld.com Those wishing to go my train, we intend to get the 9:46 from Woking. Those going directly to Winchfield should aim to be there by 10:10. We would like to know numbers so we can tell the pub how many we will be. If you would like to see the ride, you can see the route here. Our easy afternoon ride will be this Sunday, 18 September, leaving the leisure centre near the children’s playground at 2PM. We will be heading to Whitfield common with tea at Rokers. A very gentle ride of about 15 miles. May we put in a request that if you join us a on a ride would you please bring a spare inner tube. It is much easier for us to replace an inner tube than repair one. Thank you. There is a some news on the Muddy Lane campaign but I will do another e-mail about that since I would like to send it to all those who have supported the project. Pub night is Tues. 27 September. Was caught in Pyrford where we waited for 90 minutes, after then there were regular hold ups on account of the mass of cyclists, narrow roads and more accidents. In all I reckon that we waited 2.5 hours. Did the 100 miles however and have the gong. With everyone’s help, he managed to collect over £500 for Well Child. Well done Norman. The Importance of cycling helmets. Cyclists who will not wear a helmet need to reconsider the decision. Last Tuesday night I arrived at the scene of a road accident at the junction of the East Hill and Old Woking road, where a cyclist was lying in the road. Being a First Aider, I went to the assistance of the cyclist who had apparently been thrown into the windscreen of a car. The injured person had a light on his cycle but NO helmet, the visible damage to this face and head were dreadful. Friends of mine say ‘Oh a helmet messes up my hair style’ – this cyclist could now have a disfigured face for life. Please will all parents of young cyclists and adult cyclists get a helmet and while you are in the shop, a high visibility over-jacket for wearing after dark. See and be seen is my motto. Highways England appear to be a bit of a black hole and there is no obvious route to request maintenance of footpaths and cycle paths alongside trunk roads. I was out this morning and can confirm that the footpath/cycle track alongside the A3 at Wisley between Old Lane and the RHS footbridge is still poorly maintained, especially the first 50 metres, which are in a very poor state. We would be grateful if you could help ensure the need for maintenance reaches the correct department. It would be nice if we could get some action. Meanwhile, Norman has been approaching councillors for Chobham to see if the cycle route from Chobham to Woking could be reinstated. I hope that is all the information I needed to pass on this month! If not, I am sure there will be a PS. Our Easy Social ride will be this Sunday 21 August, meeting near the children’s playground in Woking Park for departure at 2PM. Pub night is August 30th, 7:30 at The Sovereigns. We have news on our campaign fronts. Norman Johns’ petition to have the footway on Byfleet Road upgraded to a shared use cycle path was presented to the Elmbridge Local Committee on 27th June. It was well received and the committee was sympathetic to the need but as is often the case, the bare minimum that could be considered would be a 2m wide off-carriageway route. This would be very expensive and there is no available budget for this kind of thing. There was some discussion about a more modest approach which would make life easier for both motorists and cyclists without creating a fully fledged shared use facility. We hope this will come to pass. Keith Cresswell, a new member interested in campaign issues has been sending out feelers to other cycle groups who might be interested in helping each other out over campaign issues. Keith will be a welcome addition to our group. The Prudential weekend of cycling will soon be upon us. Don’t forget to sign up to take part in the Prudential FreeCycle in London on 30 July. It is free. I have joined the Kingston group a few times on their ride up to London which is a lot of fun. You can read all about it on http://lcc.org.uk/events/ride-to-london-freecycle?esid=8071. You can be lazy and take the train to Surbiton and then it is only a short cycle to their meeting place in Kingston Market. They start at 9:30. If you do go up, be sure to have a laugh and stay for the Brompton World Championship which starts at 19:15. It is a Le Mans start on the Mall and no lycra allowed so there are some interesting outfits. Then on Sunday you can go and cheer Norman on who is riding for WellChild (still time to help him reach his goal) and/or go to somewhere nearby to watch the professionals whiz past you. Our easy ride will be this Sunday 17 July starting from near the Woking Park children’s play ground at 2PM. The ride will be about 15 miles long. Pub night will be 26 July. And for those who like a challenge, Chris Jeggo will be leading one of his long rides on 7 August. See our website for more information on events and campaign issues. Our AGM was held on 16 May and the full report on the meeting is published on our Web page under Useful Information. Norman’s petition to convert the A245 from Byfleet and Cobham into a shared pedestrian/cyclist path has attracted 194 signatures as of today. He will be going before the local committee at the end of June. The petition stops on 12 June so you still have a few days to sign it if you haven’t already so. A new member, Keith Cresswell, has started work on a new campaign close to the heart of a lot of our members regarding making a pedestrian/cycling lane along the A3 between Mill Lane and Wisley Lane. You can read about that also in the report on the AGM. Good news on the Muddy Lane issue. We received an e-mail from Catherine Valiant saying her report was going to the Planning and Regulatory Committee on 8 June with the recommendation that a Map Modification Order be made to change the status of the footpath to a bridleway. You can read her full report by following this link Planning & Regulatory Committee; her report is item 8. It makes interesting reading. We have no doubt there will be an objection and it will have to go to a public inquiry but at least we are moving along. Bike week is June 11 to 19. Our ride on 19 June will be part of this event. To find out other events around the country and see how you can win prizes by taking part in the ride to work challenge programme go to www.bikeweek.org.uk. George James will be leading a ride to London on 12 June to celebrate the Queen’s 90 birthday. The theme will be prince and princesses. Sign up for his e-mails at www.elmbridgecycle.org. Our long afternoon ride will be 3 July, leaving at the same time from Woking Park but a longer ride and a later return. Pub night will be 28 June. I know this is a little last minute but Norman and I are both going to be away most of June so we are going to have the AGM on Monday 16 May at 7:30 at Old Woking Community Centre, Sundridge Road, Old Woking. This is right next to Woking College off Rydens Way. Enter by the main entrance as the hall we are booked into is on the upper floor above that entrance. Come and tell us what is on your mind. If anyone would like to join the committee, you would be more than welcomed. Dues are Due. It is that time of year when I have to remind everyone that Dues are Due. Membership remains at the bargain price of £5 for one year and £20 for 5 years. The membership runs from May 31st to May 31st. Membership is for the whole family and offers discount at some cycle shops, free Sunday rides, and an opportunity to have an Affiliated membership to CyclingUK (formerly CTC.) If you wish to get the CyclingUK affiliated membership you must let us know so we can give you the code that you will need. Payment remains old fashioned—either by cheque made out to Woking Cycle User Group or cash. Payment may be sent to me at 25 Waldens Park Road, Woking, Surrey GU214RN. CTC has now been rebranded as CyclingUK. The Website is www.cyclinguk.org. As a member of WCUG, you will be able to have an affiliated CyclingUK membership. This costs £24 a year and gives you third party insurance, access to a wide range of retail discounts and their weekly e-newsletter ‘Cycle Clips’ full of all the very latest cycling news. Go to www.cyclinguk.org/membership/affiliate-membership-for-cycling-clubs-and-groups-of-all-types-and-sizes The third party insurance will guard against claims for accidental damage caused by you while cycling. (Terms and conditions apply).Please note that this membership is for third party insurance only, if you are a full member you have access to more coverage and especially legal advice. There is still time to sponsor Norman in the Prudential Ride London and sign his petition for a safer Byfleet-Cobham cycle route – see http://petitions.surreycc.gov.uk/A245CycleRoute/ . We have also been approached to see if it will be possible to have a cycle lane added to the side of the A3 from Ripley to the turn off to Wisley. Since that is in the Highways England hands rather than Surrey, we are finding it a bit more onerous. We’ll see. It sure would be nice. Muddy Lane still remains up in the air. We were assured that after the elections, more time will be devoted to this project. Here is hoping. Our easy social ride is 15 May leaving the Woking Park at 2:00. We have put routes of our rides on our Website which might be of interest for those who want to go on rides…..or those who have been on our rides and wondered where we had been! Pub night will be 31 May. I hope as many of you as possible will be able to attend our AGM on 16 May. We have our campaigning hats on again. Norman has been training for the Surrey 100 (you can still sponsor him!) and realized what a boon it would be if you could cycle down the A245 without having to take your life in your hands between Byfleet and Cobham. Soooo we have started a petition asking the council to make the footpath that runs down the side of the road into a shared cycle/pedestrian path. It wouldn’t solve the whole problem but means you can stay off that main busy “A” road for most of the way. It also keeps you off the main road if you are going from Weybridge or Byfleet past Silvermere and on to the other side of the M25 towards Ockham. If we get enough signatures on the e-petition, Norman can go to the Local committee meeting and plead the case. You can read about the proposal and sign the petition by going to: http://petitions.surreycc.gov.uk/A245CycleRoute/ If you belong to another cycling organization or know anybody who lives in Surrey and would like to see cyclists off the busy A245 ( I bet even motorists would like that!) , will you please pass on the message about signing the petition. For those foolhardy souls who didn’t believe the weather forecast, a fun Easter Egg Hunt ride was had by all those that participated. Thank you George for putting in the effort to test our observational skills……trying to spot numbers etc. through the hail was the challenge! Our second ride of the year will be 17 April. We shall be going out to check the health of the giraffes in Send. We gather near the children’s playground in Woking Park to be on our way by 2. You might want to come and practice for the Woking Bikeathon which will be on 8 May. Chris Jeggo will be leading another of his long rides on 1 May as part of our attempt to provide rides for our more experienced cyclists. The meeting place is 9:15 at the band stand in Woking Park. Hopefully more people will want to join him now that the weather is getting better. You can see the link to his Web site on our Website. Norman is still searching for sponsorship for his Prudential Ride London challenge which is in aid of Well Child so please follow the link below if you would like to help. We have listed some sites where you can find out about other rides, either charitiy rides or sportives on our Charity Rides page. Next pub night, 26 April at 7:30 at the Sovereigns on Guildford Road, Woking. I hope the weather will improve soon and we can all be back on our bikes without having to wear ski clothing! I was hoping to announce progress on the Muddy Lane saga but I fear our case officer was out of the office when I e-mailed her so that will have to wait till next time. Our Easy Social rides will be starting in March. The first one will be 20 March starting at the Leisure Centre at 2PM. These rides are about 14-18 miles long. Our ride for more experienced cyclists lead by Chris Jeggo will be on 6 March starting from the bandstand in Woking Park at 9:15. This ride will be about 45-50 miles. See our Website for more information. The Ride Social organized by Sky Rides will be on 20 Feb. and 5 March leaving Sheerwater Recreation Ground at 1:30. These rides are about 15 miles long. Breeze rides for ladies only are on 3 March and 17 March starting at 9:30 from the bridge by the Bridge Barn. These rices are about 15 miles. You can sign up by following the link on our Web site. George James from the Elmbridge cycle group is having another one of his “fairly interesting Easter Egg hunt ride” on Easter Sunday 27 March. The start will be from the Hand and Spear Pub by Weybridge Station at 10:00. It is a lot of fun and last year the winners were one of our own, the Smith family. The ride involves following clues around the area and collecting numbers. It finished around 1 with prizes for the winners and then you can stay on to have something to eat at the Hand and Spear if you wish. No need to sign up, just arrive on time. 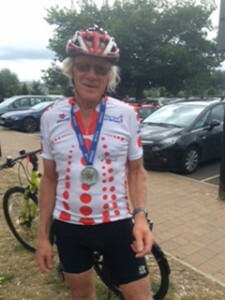 Norman Johns, our chairperson has secured a place in the Surrey 100! He will be riding for Well Child and we will put his just giving page up in case anyone would like to help him reach his sponsorship goal. On a completely different subject, we have decided that pub night will go back to starting at 7:30 instead of 7:00. If anyone has had objections please let me know. The next pub night will be next week 23 Feb. at the Sovereigns on Guildford Road. I missed the last ride of the season but I hear the Acers in Windsor Great Park did their bit by being very colourful and everyone enjoyed the ride led by Sandra. They forgot to take a picture! Annette Covey attended the Inaugural Surrey Cycle forum which was part of the Surrey Physical Activity conference. The web site for the Active Surrey is http://www.activesurrey.com/health. Annette said Dr. William Bird gave a very inspirational talk. Other speakers talked about the This Girl Can campaign and encouraging children to walk to school. The cycle forum was mainly a workshop regarding the cycle strategy to adopt for the next several years. Norman wrote to J Kingsbury, head of Woking council, to encourage him to read Sustrans’s Biggest ever cycle survey. In the biggest survey ever conducted on attitudes to cycling in the UK, three quarters (75%) of people want national governments to invest more in making cycling safer. Nearly eight in ten (79%) people say they want improved safety for people riding bikes. Three quarters (75%) support more investment in cycling, with £26/person a year the average amount people want governments to be investing. If you would like to see the survey go to http://www.sustrans.org.uk/bike-life/overall-survey. After our Christmas Do, things will be a little quiet till pub night at the end of January and our social rides will start again in March. But do go to our Other Cycle Rides page to see what else is on offer during the winter months. Chris Jeggo said he might be able to offer a ride for more experienced riders in February. Keep an eye on our website and I will let you know. Now that we have had our last easy cycle ride for the year, our final event will be the Christmas dinner. I hope all that would like to go, received Sandra’s email regarding the menu. The time is 7PM on Thus. 3 December 2015, at the Sovereigns on Guildford Road. Any questions, email Sandra at sandra_sqs_57@hotmail.com. Norman was pleased to see a new (at least to him) mobile cafe open at the top of Staples Lane on the right in the woodland car park, just before the Coomb Lane turn. It is open at weekends for hot drinks, nice snacks and an assortment of cycle repair items. Please spread the word. I heard another interesting thing this past month. One of our new members bought a bike from Evans but soon realized it really wasn’t going to suit her needs and lo and behold, Evans let her replace the bike under their “Right Bike Guarantee.” I had never heard of this but thought it was worth spreading the information. Maybe all shops do this and I am just not well informed. Once again we were blessed with fabulous weather for our all day ride last Sunday and a good time was had by all. It was very crowded at Covent Garden but that was no surprise and it was fun seeing all the Shaun the Sheeps. The menu can be found on this link so be sure to let Sandra know your choice when you email her. http://www.emberinns.co.uk/content/dam/ember/pdf/LN15/pub/the-sovereigns-woking-festivefayremenu.pdf We hope you can make it. Our last easy social ride will be to see the Acer Wood in Windsor Great Park. Here is hoping the cool nights will paint the leaves! The date is 18 October and Sandra will be leading it. We will start from near the children’s play ground in Woking Park at 2:00. Pub night will be 27 October at the Sovereigns. – Access to a wide range of retail discounts. For members who would like to avail themselves of the offer, please e-mail me to get the code. I send this e-mail to members and non-members alike so hence the reason I am not able to publish the code here. Once again, the real “to do” is to notify Sandra that you can make the Christmas Do and what you would like to eat. Now that rainy August is behind us, I wonder if Indian Summer is on the way. Actually August wasn’t too bad till the end of the month. Congratulations to all those who took part in challenges this summer. We were fortunate the weather was great for the Prudential Ride Surrey weekend but I don’t think the Breeze ride in Windsor was very good. Norman took on the challenge of getting the Nuffield in Woking to put in cycle stands for their visitors. He also reminded Woking of a few pot holes that need repairing. I hope everyone knows about www.fillthathole.org.uk where you can report pot holes and hopefully they will be filled. Our easy social ride will be on 20 September starting at 2 PM at Woking Leisure centre near the children’s playground. Our all day ride to see the great Shaun the Sheep roundup will be 27 September. We will be meeting on the car park side of Woking station ready to leave at 9am. 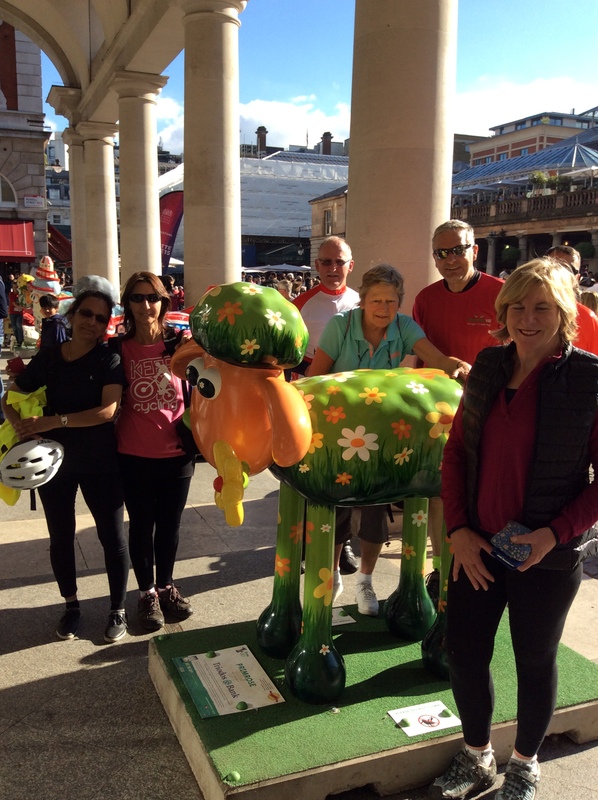 We will be cycling to London via the Thames Path, Richmond Park, Barnes Common, Putney, Brompton Cemetery, Hyde Park, Green Park and on to Covent Garden where the round up will be in progress. We will be stopping for coffee and lunch along the way and coming back by train from Waterloo Station. The whole journey from Woking is about 35 miles. We will have an alternative meting point by the coffee van at Walton Bridge. If you are going to meet us there, you should be there about 9:45. Would those who would like to join us please send me an e-mail so we will not leave without you and also tell me where you will be joining us…..Woking or Walton Bridge. Pub night is 29 September at the Sovereigns on Guildford Road, Woking. 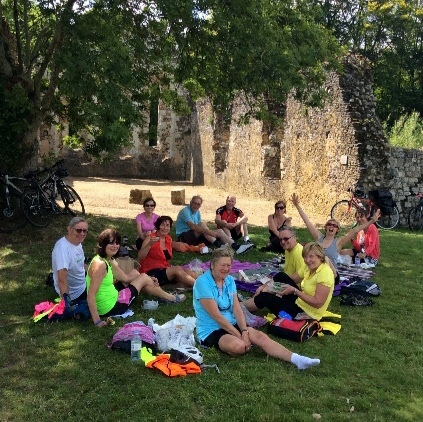 WCUG cyclists enjoy a picnic lunch in splendid weather at the ruins of Waverley Abbey, near Farnham, on an all-day ride led by Carole. Congratulations to WCUG member Annette Covey. 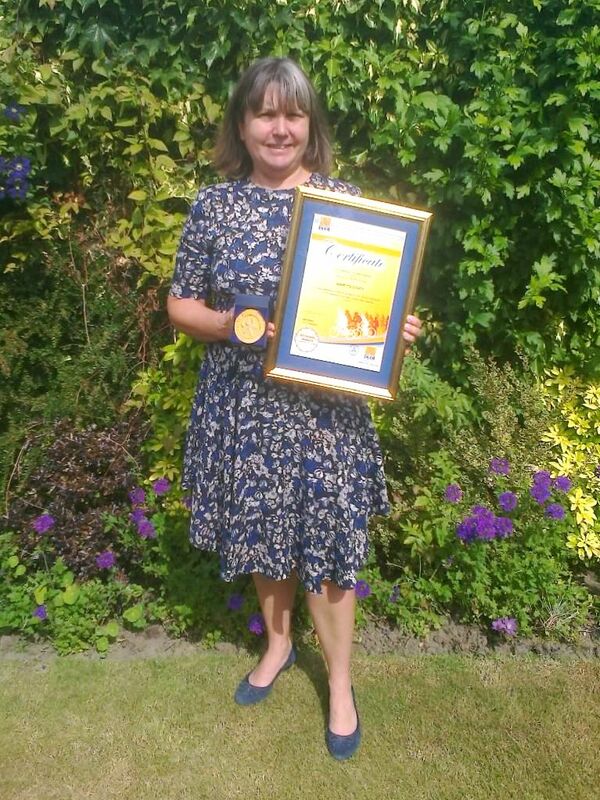 The CTC, the national cycling charity, has presented her with their 2015 South-east England ‘Volunteer of the Year’ award, for her sterling work with the Surrey Wheels for All campaign, which encourages less-abled people to participate in cycling. Read more about Wheels for All on our Special Needs page.